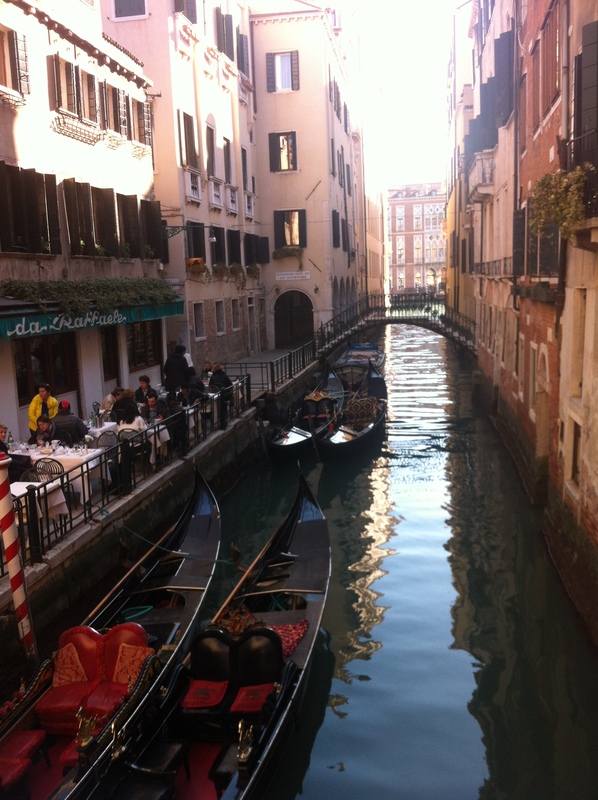 In the morning, we navigated the winding cobblestone streets from the outskirts of Cannaregio south to Dorsoduro, a sestieri (district) snuggled up against Venice’s most famous sestieri, San Marco. We’d scheduled a mask-making workshop at a tiny store called Ca’ Macana located down a cramped side street in Dorsoduro. Initially, I’d worried that the 2.5 hour session would be a bit much for our loquacious and energetic students, but I was wrong. Once we’d all settled around wooden tables in the back room, a friendly Italian instructor showed us a series of photographs depicting Venetians donning their famous masks, which were meant to disguise both the face and the social status. He showed us a photograph of a doge, or leader of the city, casually interacting with a servant – both masked and equal. I thought these would be a great idea for our student group, but the girls disagreed. 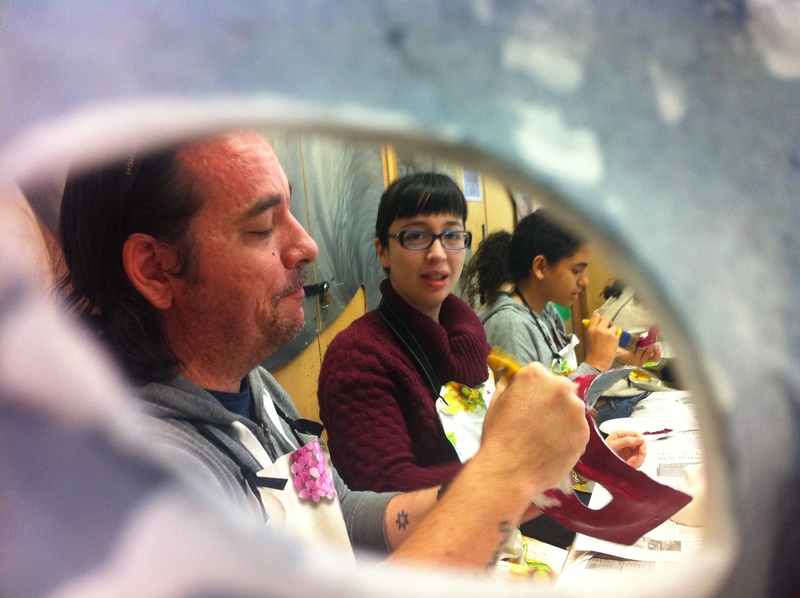 After a brief history and explanation of how the masks are actually made – through which the students were attentive and intrigued – everyone chose a mask and a color gradient and were given instructions on how to proceed. Because all of the choices are so different, some students were able to jump right in and paint a base coat while others, myself included, chose various gradients that required simple but additional instruction. The 2.5 hours flew by. If letters to Juliet was the highlight of Verona, the mask-making workshop at Ca’ Macana was easily the highlight of Venice – and that’s competing with the fact that we were there on Mardi Gras, in San Marco, surrounded by the Mad Hatter and Marie Antoinette and a steampunk quartet. 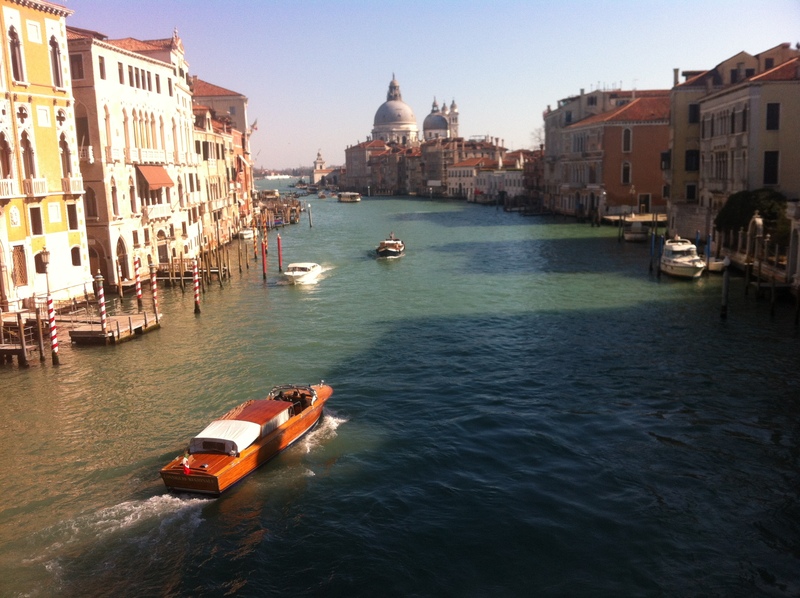 If you make it to Venice before it sinks, do this. It was an authentic, unique opportunity to get a hands-on experience with Venetian culture and history, and way cooler than purchasing a mask off the street. Piazza San Marco, a five minute walk from Ca’ Macana, was heaving with Carnevale enthusiasts celebrating Mardi Gras in the city where Carnevale was born. I’ve never been to Mardi Gras in New Orleans, but I can say this about Venice: the costumes are out of this world. Picture custom-fitted corsets, silk, wigs, men in britches with tights and low heels. Picture gilded masks and eye masks and long proboscis a la Black Plague masks. The cobbled plaza of San Marco was a carpet of pastel confetti. I loved it. David and I ventured into Cafe Lavena, a notable historic coffee bar and restaurant offering bright views of Piazza San Marco. For only 2 euro, we sipped espressos at the bar – tavola, or table prices, are a bit higher – beside a tall gentleman dressed in cornflower blue Victorian garb. “You think this is crazy, imagine the looks we got walking into the supermarket yesterday,” he told me after I asked for a photo. It seemed strange that anyone would regard him as out of place, especially considering the flamboyant costumes of everyone in the square. Feeling a bit square and excluded ourselves, David and I tied our masks on and wandered out of San Marco to the water bus tops where two separate ticket sellers provided us with conflicting information regarding which bus stopped directly in front of our hotel. This proved quite the ordeal – was it bus 42, that terminated in Lido? Or bus 51? and which platform? Twice we were sent back to our original point of inquiry. It seems Italian transportation officials enjoy the pastime of confusing tourists. Hassle or not, nothing could tarnish the bronze glow of the setting sun against the curved dome of Basilica di Santa Maria della Salute and the dusty pink reflections of the fading sky in the Grand Canal. 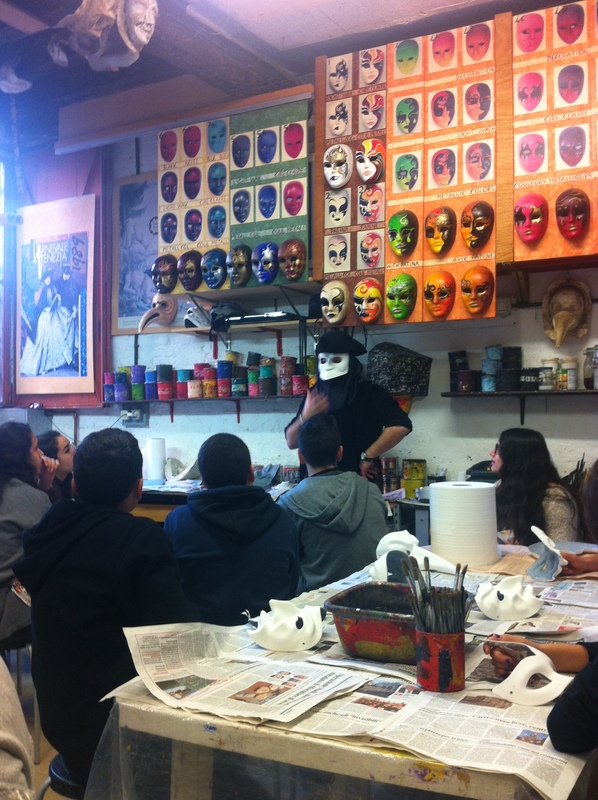 Please explain further how this works as a school trip…did the 9th graders just get to go wander after mask-making? That’s what it sounded like from your description! Or are there other adults with them? I can’t imagine taking NJ 9th graders to another country at all, let along giving them the freedom to do ANYTHING on their own. This is amazing! Hey Lindsay! This was sort of a lucky add-onto our Verona trip we do each year: take the kids to Verona to create a documentary/recreate a scene from Romeo and Juliet. Somehow we got Venice on the list! We were with them nearly all the time apart from one hour they got for lunch in a chosen area and one hour for shopping in San Marco. They only got their freedom if they made their check-ins on time and were good at the hotel…I realize after teaching abroad that international schools are less strict than US ones. It takes getting used to! Well, the trip leader is a really amazing guy and he organised a great trip for the students. We did give students free time to shop and look around, which is what they really were there for. We kept the reins on and freedom was limited, but we didn’t think it would be a problem. The benefit of teaching in Egypt is a more lax attitude towards rules and the parents were happy for us to let their children wander and spend money. The culture is different outside the USA, so, when in Rome! “Shop and look around”…at other shops. Man, you guys have a very cool job! I mean minus the occasional unrest and unreliable buses and all that other stuff that comes with living in the Middle East. Next time you need a chaperone to Rome, I’m in.